Croatia first appeared as two duchies in the 7th century, the Duchy of Croatia and the Duchy of Pannonian Croatia, which were united and elevated into the Croatian Kingdom which lasted from 925 until 1918. From the 12th century the Kingdom of Croatia entered a Personal Union with the Kingdom of Hungary, it remained a distinct state with its ruler (Ban) and Sabor, but it elected Royal dynasties from neighboring powers, primarily Hungary, Naples and Austria. The period from the 15th to the 17th centuries was marked by bitter struggles with the Ottoman Empire. After being incorporated in Yugoslavia for most of the 20th century, Croatia regained independence in 1991. The area known today as Croatia was inhabited throughout the prehistoric period. Fossils of Neanderthals dating to the middle Palaeolithic period have been unearthed in northern Croatia, with the most famous and the best presented site in Krapina. Remnants of several Neolithic and Chalcolithic cultures were found in all regions of the country. The largest proportion of the sites is in the northern Croatia river valleys, and the most significant cultures whose presence was discovered include Starčevo, Vučedol and Baden cultures. The Iron Age left traces of the early Illyrian Hallstatt culture and the Celtic La Tène culture. Much later, the region was settled by Liburnians and Illyrians, while the first Greek colonies were established on the Vis and Hvar islands. Dalmatia was the northern part of the Illyrian kingdom between the 4th century BC until the Illyrian Wars in the 220s BC and 168 BC when the Roman Republic established its protectorate south of the river Neretva. The area north of the Neretva was slowly incorporated into Roman possession until the province of Illyricum was formally established c. 32–27 BC. 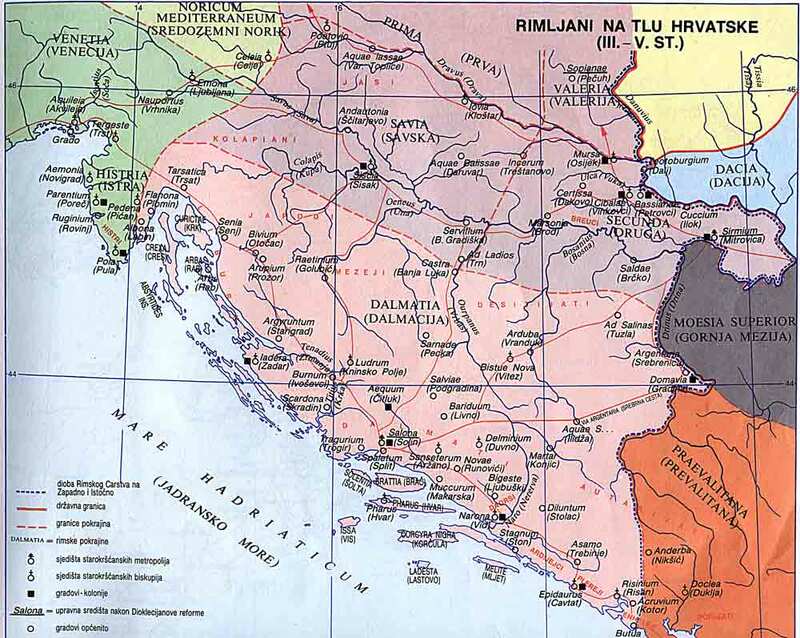 The Dalmatia region then became part of the Roman province of Illyricum. Between 6 and 9 AD the Dalmatians raised the last in a series of revolts together with the Pannonians, but it was finally crushed and in 10 AD Illyricum was split into two provinces, Pannonia and Dalmatia. The province of Dalmatia spread inland to cover all of the Dinaric Alps and most of the eastern Adriatic coast. Dalmatia was the birthplace of the Roman Emperor Diocletian, who, upon retirement from Emperor in AD 305, built a large palace near Salona, out of which the city of Split later developed. Historians such as Theodore Mommsen and Bernard Bavant argue that all Dalmatia was fully romanized and Latin speaking by the 4th century. Others, such as Aleksandar Stipčević, argue that the process of romanization was rather selective and involved mostly urban centers but not the countryside, where previous Illyrian socio-political structures were adapted to Roman administration and political structure only in some necessities. After the Western Roman Empire collapsed in 476, with the beginning of the Migration Period, Julius Nepos shortly ruled his diminished domain from the Diocletian palace after his 476 flight from Italy. The region was then ruled by the Ostrogoths up to 535, when Justinian I added the territory to the Byzantine Empire. Later, the Byzantines formed the Theme of Dalmatia in the same territory. The Roman period ends with Avar and Croat invasions in the 6th and 7th centuries and the destruction of almost all Roman towns. Roman survivors retreated to more favourable sites on the coast, islands and mountains. The city of Ragusa was founded by such survivors from Epidaurum. Oton Iveković, The Croats arrival at the Adriatic Sea. According to the work De Administrando Imperio written by the 10th-century Byzantine Emperor Constantine VII, the Croats had arrived in what is today Croatia, from southern Poland, south of Kraków in the early 7th century, however that claim is disputed and competing hypotheses date the event between the 6th and the 9th centuries. Eventually two dukedoms were formed—Duchy of Pannonia and Duchy of Dalmatia, ruled by Liudewit and Borna, as attested by chronicles of Einhard starting in the year 818. The record represents the first document of Croatian realms, vassal states of Francia at the time. The Frankish overlordship ended during the reign of Mislav two decades later. According to the Constantine VII christianization of Croats began in the 7th century, but the claim is disputed and generally christianization is associated with the 9th century. In 879, under duke Branimir, the duke of Croats, Dalmatian Croatia received papal recognition as a state from Pope John VIII. A map of the largest territorial extent of the Kingdom of Croatia. Tomislav was the first ruler of Croatia who was styled a king in a letter from the Pope John X, dating kingdom of Croatia to year 925. Tomislav defeated Hungarian and Bulgarian invasions, spreading the influence of Croatian kings. The medieval Croatian kingdom reached its peak in the 11th century during the reigns of Petar Krešimir IV (1058–1074) and Dmitar Zvonimir (1075–1089). When Stjepan II died in 1091 ending the Trpimirović dynasty, Ladislaus I of Hungary claimed the Croatian crown. Opposition to the claim led to a war and personal union of Croatia and Hungary in 1102, ruled by Coloman. Map of the Venetian Republic, c. 1000. The republic is in dark red, borders in light red. The consequences of the change to the Hungarian king included the introduction of feudalism and the rise of the native noble families such as Frankopan and Šubić. The later kings sought to restore some of their previously lost influence by giving certain privileges to the towns. For the next four centuries, the Kingdom of Croatia was ruled by the Sabor (parliament) and a Ban (viceroy) appointed by the king. The princes of Bribir from the Šubić family became particularly influential, asserting control over large parts of Dalmatia, Slavonia and Bosnia. Later, however, the Angevins intervened and restored royal power. The period saw rise of native nobility such as the Frankopans and the Šubićs to prominence and ultimately numerous Bans from the two families. Separate coronation as King of Croatia was gradually allowed to fall into abeyance and last crowned king is Charles Robert in 1301 after which Croatia contented herself with a separate diploma inaugurale. The reign of Louis the Great (1342–1382) is considered the golden age of Croatian medieval history. Ladislaus of Naples also sold the whole of Dalmatia to Venice in 1409. The period saw increasing threat of Ottoman conquest and struggle against the Republic of Venice for control of coastal areas. The Venetians gained control over most of Dalmatia by 1428. With exception of the city-state of Dubrovnik which became independent, the rule of Venice on most of Dalmatia will last nearly four centuries (c. 1420 – 1797). As the Turkish incursion into Europe started, Croatia once again became a border area. The Croats fought an increasing number of battles and gradually lost increasing swathes of territory to the Ottoman Empire. Ottoman conquests led to the 1493 Battle of Krbava field and 1526 Battle of Mohács, both ending in decisive Ottoman victories. King Louis II died at Mohács, and in November 1526, a Hungarian parliament elected János Szapolyai as the new king of Hungary. In December 1526, an other Hungarian parliament elected Ferdinand Habsburg as King of Hungary. On the other side, the Croatian Parliament met in Cetin and chose Ferdinand I of the House of Habsburg as new ruler of Croatia, under the condition that he provide protection to Croatia against the Ottoman Empire while respecting its political rights. A few years later both crown would be again united in Habsburgs hands and the union would be restored. The Ottoman Empire further expanded in the 16th century to include most of Slavonia, western Bosnia (then called Turkish Croatia) and Lika. Ottoman Croatia initially was part of Rumelia Eyalet, and later was parts of Budin Eyalet, Bosnia Eyalet and Kanije Eyalet. 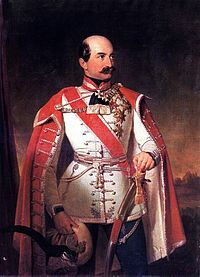 Later in the same century, Croatia was so weak that its parliament authorized Ferdinand Habsburg to carve out large areas of Croatia and Slavonia adjacent to the Ottoman Empire for the creation of the Military Frontier (Vojna Krajina, German: Militaergrenze) which would be ruled directly from Vienna's military headquarters. The area became rather deserted and was subsequently settled by Serbs, Vlachs, Croats and Germans and others. As a result of their compulsory military service to the Habsburg Empire during conflict with the Ottoman Empire, the population in the Military Frontier was free of serfdom and enjoyed much political autonomy, unlike the population living in the parts ruled by Hungary. After the Bihać fort finally fell in 1592, only small parts of Croatia remained unconquered. The Ottoman army was successfully repelled for the first time on the territory of Croatia following the battle of Sisak in 1593. The lost territory was partially restored, except for large parts of today's Bosnia and Herzegovina, Lika and Slavonia regions of present Croatia. By the 18th century, the Ottoman Empire was driven out of Hungary, and Austria brought the empire under central control. Empress Maria Theresa of Austria was supported by the Croatians in the War of Austrian Succession of 1741–1748 and subsequently made significant contributions to Croatian matters. With the fall of the Venetian Republic in 1797, its possessions in eastern Adriatic became subject to a dispute between France and Austria. The Habsburgs eventually secured them (by 1815) and Dalmatia and Istria became part of the empire, though they were in Cisleithania while Croatia and Slavonia were under Hungary. Croatian romantic nationalism emerged in the mid-19th century to counteract the apparent Germanization and Magyarization of Croatia. The Illyrian movement attracted a number of influential figures from the 1830s on, and produced some important advances in the Croatian language and culture. In the Revolutions of 1848 the Triune Kingdom of Croatia, Slavonia and Dalmatia, driven by fear of Magyar nationalism, supported the Habsburg court against Hungarian revolutionary forces. However, despite the contributions of its ban Jelačić in quenching the Hungarian war of independence, Croatia, not treated any more favourably by Vienna than the Hungarians themselves, lost its domestic autonomy. In 1867 the Dual Monarchy was created; Croatian autonomy was restored in 1868 with the Croatian–Hungarian Settlement which was comparatively favourable for the Croatians, but still problematic because of issues such as the unresolved status of Rijeka. World War I brought an end to the Habsburg Empire. Croatia suffered great loss of life in the war, and while there was some late effort to establish a Croatian section of the Empire, ultimately the military defeat led to the establishment of a separate South Slavic state, which would later be named Yugoslavia. Shortly before the end of the First World War in 1918, the Croatian Parliament severed relations with Austria-Hungary as the Entente armies defeated those of the Habsburgs. Croatia and Slavonia became a part of the State of Slovenes, Croats and Serbs composed out of all Southern Slavic territories of the now former Austro-Hungarian Monarchy with a transitional government headed in Zagreb. The creation of Yugoslavia happened in late 1918: after Srijem left Croatia-Slavonia and joined Serbia together with Vojvodina, shortly followed by a referendum to join Bosnia and Herzegovina to Serbia, the People's Council of Slovenes, Croats and Serbs (Narodno vijeće), guided by what was by that time a half a century long tradition of pan-Slavism and without sanction of the Croatian sabor, joined the Kingdom of Serbia into the Kingdom of the Serbs, Croats and Slovenes. Although the state inherited much of Austro-Hungary's military arsenal, including the entire fleet, the Kingdom of Italy moved rapidly to annex the state's most western territories, promised to her by the Treaty of London of 1915. An Italian Army eventually took Istria, started to annex the Adriatic islands one by one, and even landed in Zadar. Partial resolution to the so-called Adriatic Question would come in 1920 with the Treaty of Rapallo. The Kingdom underwent a crucial change in 1921 to the dismay of Croatia's largest political party, the Croatian Peasant Party (Hrvatska seljačka stranka). The new constitution abolished the historical/political entities, including Croatia and Slavonia, centralizing authority in the capital of Belgrade. The Croatian Peasant Party boycotted the government of the Serbian People's Radical Party throughout the period, except for a brief interlude between 1925 and 1927, when external Italian expansionism was at hand with her allies, Albania, Hungary, Romania and Bulgaria that threatened Yugoslavia as a whole. In the early 1920s the Yugoslav government of Serbian prime minister Nikola Pasic used police pressure over voters and ethnic minorities, confiscation of opposition pamphlets and other measures of election rigging to keep the opposition, and mainly the Croatian Peasant Party and its allies in minority in Yugoslav parliament. Pasic believed that Yugoslavia should be as centralized as possible, creating in place of distinct regional governments and identities a Greater Serbian national concept of concentrated power in the hands of Belgrade. During a Parliament session in 1928, the Croatian Peasant Party's leader Stjepan Radić was mortally wounded by Puniša Račić, a deputy of the Serbian Radical People's Party, which caused further upsets among the Croatian elite. In 1929, King Aleksandar proclaimed a dictatorship and imposed a new constitution which, among other things, renamed the country the Kingdom of Yugoslavia. The territory of Croatia was largely divided into the territories of the Sava and Littoral Banates. Political parties were banned from the start and the royal dictatorship took on an increasingly harsh character. Vladko Maček, who had succeeded Radić as leader of the Croatian Peasant Party, the largest political party in Croatia, was imprisoned, and members of a newly emerging insurgent movement, the Ustaše, went into exile. According to the British historian Misha Glenny the murder in March 1929 of Toni Schlegel, editor of a pro-Yugoslavian newspaper Novosti, brought a "furious response" from the regime. In Lika and west Herzegovina in particular, which he described as "hotbeds of Croatian separatism," he wrote that the majority-Serb police acted "with no restraining authority whatsoever." In the words of a prominent Croatian writer, Shlegel's death became the pretext for terror in all forms. Politics was soon "indistinguishable from gangsterism." Even in this oppressive climate, few rallied to the Ustaša cause and the movement was never able to organise within Croatia. But its leaders did manage to convince the Communist Party that it was a progressive movement. The party's newspaper Proleter (December 1932) stated: "[We] salute the Ustaša movement of the peasants of Lika and Dalmatia and fully support them." In 1934, King Aleksandar was assassinated abroad, in Marseille, by a coalition of the Ustaše and a similarly radical movement, the Bulgarian VMORO. The Serbian-Croatian Cvetković-Maček government that came to power, distanced Yugoslavia's former allies of France and the United Kingdom, and moved closer to Fascist Italy and Nazi Germany in the period of 1935–1941. A national Banovina of Croatia was created in 1939 out of the two Banates, as well as parts of the Zeta, Vrbas, Drina and Danube Banates. It had a reconstructed Croatian Parliament which would choose a Croatian Ban and Viceban. This Croatia included a part of Bosnia, most of Herzegovina and the city of Dubrovnik and the surroundings. Flag of the Independent State of Croatia. The corpses of an entire Serb family in their home after being massacred by Ustaša militia. The Axis occupation of Yugoslavia in 1941 allowed the Croatian radical right Ustaše to come into power, forming the "Independent State of Croatia" (Nezavisna Država Hrvatska, NDH), led by Ante Pavelić, who assumed the role of Poglavnik. Following the pattern of other fascist regimes in Europe, the Ustashi enacted racial laws, formed eight concentration camps targeting minority Serbs, Romas and Jewish populations, as well as Croatian and Bosnian Muslim partisans. The biggest concentration camp was Jasenovac in Croatia. The NDH had a program, formulated by Mile Budak, to purge Croatia of Serbs, by "killing one third, expelling the other third and assimilating the remaining third". The main targets for persecution were the Serbs, with approximately 330,000 were killed. The anti-fascist communist-led Partisan movement, based on pan-Yugoslav ideology, emerged in early 1941, under the command of Croatian-born Josip Broz Tito, spreading quickly into many parts of Yugoslavia. The 1st Sisak Partisan Detachment, often hailed as the first armed anti-fascist resistance unit in occupied Europe, was formed in Croatia, in the Brezovica Forest near the town of Sisak. As the movement began to gain popularity, the Partisans gained strength from Croats, Bosniaks, Serbs, Slovenes, and Macedonians who believed in a unified, but federal, Yugoslav state. By 1943, the Partisan resistance movement had gained the upper hand, against the odds, and in 1945, with help from the Soviet Red Army (passing only through small parts such as Vojvodina), expelled the Axis forces and local supporters. The ZAVNOH, state anti-fascist council of people's liberation of Croatia, functioned since 1942 and formed an interim civil government by 1943. NDH's ministers of War and Internal Security Mladen Lorković and Ante Vokić tried to switch to Allied side. Pavelić was in the beginning supporting them but when he found that he would need to leave his position he imprisoned them in Lepoglava prison where they were executed. Following the defeat of the Independent State of Croatia at the end of the war, a large number of Ustaše, civilians supporting them (ranging from sympathizers, young conscripts, anti-communists, and ordinary serfs who were motivated by Partisan atrocities), Chetniks and anti-Communists attempted to flee in the direction of Austria hoping to surrender to British forces and to be given refuge. They were instead interned by British forces and then returned to the Partisans. Croatia was a Socialist Republic part of a six-part Socialist Federative Republic of Yugoslavia. Under the new communist system, privately owned factories and estates were nationalized, and the economy was based on a type of planned market socialism. The country underwent a rebuilding process, recovered from World War II, went through industrialization and started developing tourism. The country's socialist system also provided free apartments from big companies, which with the workers' self-management investments paid for the living spaces. From 1963, the citizens of Yugoslavia were allowed to travel to almost any country because of the neutral politics. No visas were required to travel to eastern or western countries, or to capitalist or communist nations. Such free travel was unheard of at the time in the Eastern Bloc countries, and in some western countries as well (e.g., Spain or Portugal, both dictatorships at the time). This proved to be very helpful for Croatia's inhabitants who found working in foreign countries more financially rewarding. Upon retirement, a popular plan was to return to live in Croatia (then Yugoslavia) to buy a more expensive property. In Yugoslavia, the people of Croatia were guaranteed free healthcare, free dental care, and secure pensions. The older generation found this very comforting as pensions would sometimes exceed their former paychecks. Free trade and travel within the country also helped Croatian industries that imported and exported throughout all the former republics. Students and military personnel were encouraged to visit other republics to learn more about the country, and all levels of education, especially secondary education and higher education, were free. In reality the housing was inferior with poor heat and plumbing, the medical care often lacking even in availability of antibiotics, schools were propaganda machines and travel was a necessity to provide the country with hard currency. The propagandists, who want people to believe "neutral policies" equalized Serbs and Croats, severely restricted free speech and did not protect citizens from ethnic attacks. Membership in the party was as much a prerequisite for admission to colleges and for government jobs as in the Soviet Union under Joseph Stalin or Nikita Khrushchev. Private sector businesses did not grow as the taxes on private enterprise were often prohibitive. Inexperienced management sometimes ruled policy and controlled decisions by brute force. Strikes were forbidden, owners/managers were not permitted to make changes or decision which would impact their productivity or profit. The economy developed into a type of socialism called samoupravljanje (self-management), in which workers controlled socially owned enterprises. This kind of market socialism created significantly better economic conditions than in the Eastern Bloc countries. Croatia went through intensive industrialization in the 1960s and 1970s with industrial output increasing several-fold and with Zagreb surpassing Belgrade for the amount of industry. Factories and other organizations were often named after Partisans who were declared national heroes. This practice also spread to street names, names of parks and buildings, and some more trivial features. Before World War II, Croatia's industry was not significant, with the vast majority of the people employed in agriculture. By 1991 the country was completely transformed into a modern industrialized state. By the same time, the Croatian Adriatic coast had taken shape as an internationally popular tourist destination, all coastal republics (but mostly SR Croatia) profited greatly from this, as tourist numbers reached levels still unsurpassed in modern Croatia. The government brought unprecedented economic and industrial growth, high levels of social security and a very low crime rate. The country completely recovered from WWII and achieved a very high GDP and economic growth rate, significantly higher than those of the present-day republic. The constitution of 1963 balanced the power in the country between the Croats and the Serbs and alleviated imbalance coming from the fact that the Croats were again in a minority position. Trends after 1965 (like the fall of OZNA and UDBA chief Aleksandar Ranković from power in 1966), however, led to the Croatian Spring of 1970–71, when students in Zagreb organized demonstrations to achieve greater civil liberties and greater Croatian autonomy. The regime stifled the public protest and incarcerated the leaders, but this led to the ratification of a new constitution in 1974, giving more rights to the individual republics. At that time, radical Ustaše cells of Croatian émigrés in Western Europe planned and carried out guerilla acts inside Yugoslavia, but they were largely countered. In 1980, after Tito's death, economic, political, and religious difficulties started to mount and the federal government began to crumble. The crisis in Kosovo and, in 1986, the emergence of Slobodan Milošević in Serbia provoked a very negative reaction in Croatia and Slovenia; politicians from both republics feared that his motives would threaten their republics' autonomy. With the climate of change throughout Eastern Europe during the 1980s, the communist hegemony was challenged (at the same time, the Milošević government began to gradually concentrate Yugoslav power in Serbia and calls for free multi-party elections were becoming louder). In June 1989 the Croatian Democratic Union (HDZ) was founded by Croatian nationalist dissidents led by Franjo Tuđman, a former fighter in Tito's Partisan movement and JNA General. At this time Yugoslavia was still a one-party state and open manifestations of Croatian nationalism were dangerous so a new party was founded in an almost conspiratorial manner. It was only on 13 December 1989 that the governing League of Communists of Croatia agreed to legalize opposition political parties and hold free elections in the spring of 1990. On 23 January 1990 at its 14th Congress the Communist League of Yugoslavia voted to remove its monopoly on political power, but the same day effectively ceased to exist as a national party when the League of Communists of Slovenia walked out after Serbia's Slobodan Milošević blocked all their reformist proposals—the League of Communists of Croatia walked out soon after. On 22 April and 7 May 1990, the first free multi-party elections were held in Croatia. Franjo Tuđman's Croatian Democratic Union (HDZ) won by a 42% margin against Ivica Račan's reformed communist Party of Democratic Change (SDP) who won 26%. However, Croatia's first-past-the-post election system enabled Tuđman to form the government relatively independently as the win translated into 205 mandates (out of 351 total). The HDZ's intentions were to secure independence for Croatia, contrary to the wishes of a part of the ethnic Serbs in the republic, and federal politicians in Belgrade. The excessively polarized climate soon escalated into complete estrangement between the two nations and spiralled into sectarian violence. On 25 July 1990, a Serbian Assembly was established in Srb, north of Knin, as the political representation of the Serbian people in Croatia. The Serbian Assembly declared "sovereignty and autonomy of the Serb people in Croatia". Their position was that if Croatia could secede from Yugoslavia, then the Serbs could secede from Croatia. Milan Babić, a dentist from the southern town of Knin, was elected president. The rebel Croatian Serbs established a number of paramilitary militias under the leadership of Milan Martić, the police chief in Knin. On 17 August 1990, the Serbs began what became known as the Log Revolution, where barricades of logs were placed across roads throughout the South as an expression of their secession from Croatia. This effectively cut Croatia in two, separating the coastal region of Dalmatia from the rest of the country. The Croatian government responded to the blockade of roads by sending special police teams in helicopters to the scene, but they were intercepted by SFR Yugoslav Air Force fighter jets and forced to turn back to Zagreb. The Croatian constitution was passed in December 1990 categorizing Serbs as a minority group along with other ethnic groups. Babić's administration announced the creation of a Serbian Autonomous Oblast of Krajina (or SAO Krajina) on 21 December 1990. Other Serb-dominated communities in eastern Croatia announced that they would also join SAO Krajina and ceased paying taxes to the Zagreb government. On Easter Sunday, 31 March 1991, the first fatal clashes occurred when Croatian police from the Croatian Ministry of the Interior (MUP) entered the Plitvice Lakes national park to expel rebel Serb forces. Serb paramilitaries ambushed a bus carrying Croatian police into the national park on the road north of Korenica, sparking a day-long gun battle between the two sides. During the fighting, two people, one Croat and one Serb policeman, were killed. Twenty other people were injured and twenty-nine Krajina Serb paramilitaries and policemen were taken prisoner by Croatian forces. Among the prisoners was Goran Hadžić, later to become the President of the Republic of Serbian Krajina. On 2 May 1991 the Croatian parliament voted to hold a referendum on independence. On 19 May 1991, on an almost 80% turnout, 93.24% voted for independence. Krajina boycotted the referendum. They held their own referendum a week earlier on 12 May 1991 in the territories they controlled and voted to remain in Yugoslavia which the Croatian government did not recognize as valid. On 25 June 1991 the Croatian Parliament declared independence from Yugoslavia. Slovenia declared independence from Yugoslavia on the same day. The civilian population fled the areas of armed conflict en masse: generally speaking, hundreds of thousands of Croats moved away from the Bosnian and Serbian border areas. In many places, masses of civilians were forced out by the Yugoslav National Army (JNA), who consisted mostly of conscripts from Serbia and Montenegro, and irregulars from Serbia, in what became known as ethnic cleansing. The border city of Vukovar underwent a three-month siege – the Battle of Vukovar – during which most of the city was destroyed and a majority of the population was forced to flee. The city fell to the Serbian forces on 18 November 1991 and the Vukovar massacre occurred. Subsequent UN-sponsored cease-fires followed, and the warring parties mostly entrenched. The Yugoslav People's Army retreated from Croatia into Bosnia and Herzegovina where a new cycle of tensions were escalating: the Bosnian War was to start. During 1992 and 1993, Croatia also handled an estimated 700,000 refugees from Bosnia, mainly Bosnian Muslims. Armed conflict in Croatia remained intermittent and mostly on a small scale until 1995. In early August, Croatia embarked on Operation Storm. The Croatian attack quickly reconquered most of the territories from the Republic of Serbian Krajina authorities, leading to a mass exodus of the Serbian population. An estimated 90,000–200,000 Serbs fled shortly before, during and after the operation. As a result of this operation, a few months later the Bosnian war ended with the negotiation of the Dayton Agreement. A peaceful integration of the remaining Serbian-controlled territories in eastern Slavonia was completed in 1998 under UN supervision. The majority of the Serbs who fled from the former Krajina have not returned due to fears of ethnic violence, discrimination and property repossession problems, and the Croatian government has yet to achieve the conditions for full reintegration. According to United Nations High Commissioner for Refugees, around 125,000 ethnic Serbs who fled the 1991–1995 conflict are registered as having returned to Croatia, of whom around 55,000 remain permanently. Croatia became a member of the Council of Europe in 1996. The years 1996 and 1997 were a period of post-war recovery and improving economic conditions. However, in 1998 and 1999 Croatia experienced an economic depression, which brought unemployment for thousands of citizens. The remaining part of former "Krajina", areas adjacent to FR Yugoslavia, negotiated a peaceful reintegration process with the Croatian government. The so-called Erdut Agreement made the area a temporary protectorate of the UN Transitional Administration for Eastern Slavonia, Baranja and Western Sirmium. The area was formally re-integrated into Croatia by 1998. Franjo Tuđman's government started to lose popularity as it was criticized (among other things) for its involvement in suspicious privatization deals of the early 1990s as well as a partial international isolation. The country experienced a mild recession in 1998 and 1999. Tuđman died in 1999 and in the early 2000 parliamentary elections, the nationalist Croatian Democratic Union (HDZ) government was replaced by a center-left coalition under the Social Democratic Party of Croatia, with Ivica Račan as prime minister. At the same time, presidential elections were held which were won by a moderate, Stjepan Mesić. The new Račan government amended the constitution, changing the political system from a presidential system to a parliamentary system, transferring most executive presidential powers from the president to the institutions of the parliament and the prime minister. The new government also started several large building projects, including state-sponsored housing, more rebuilding efforts to enable refugee return, and the building of the A1 highway. The country achieved notable economic growth during these years, while the unemployment rate would continue to rise until 2001 when it finally started falling. Croatia became a World Trade Organization (WTO) member in 2000 and started the Accession of Croatia to the European Union in 2003. In late 2003, new parliamentary elections were held and a reformed HDZ party won under the leadership of Ivo Sanader, who became prime minister. European accession was delayed by controversies over the extradition of army generals to the ICTY, including the runaway Ante Gotovina. Sanader was reelected in the closely contested 2007 parliamentary election. Other complications continued to stall the EU negotiating process, most notably Slovenia's blockade of Croatia's EU accession in 2008–2009. In June 2009, Sanader abruptly resigned his post and named Jadranka Kosor in his place. Kosor introduced austerity measures to counter the economic crisis and launched an anti-corruption campaign aimed at public officials. In late 2009, Kosor signed an agreement with Borut Pahor, the premier of Slovenia, that allowed the EU accession to proceed. In the Croatian presidential election, 2009–2010, Ivo Josipović, the candidate of the SDP won a landslide victory. Sanader tried to come back into HDZ in 2010, but was then ejected, and USKOK soon had him arrested on several corruption charges. As of 2012[update], his trial is ongoing. In 2011, the accession agreement was concluded, giving Croatia the all-clear to join. The Croatian parliamentary election, 2011 was held on 4 December 2011, and the Kukuriku coalition won. Following the ratification of the Treaty of Accession 2011 and the successful Croatian European Union membership referendum, 2012, Croatia joined the EU on 1 July 2013. In the Croatian presidential election, 2014–15, Kolinda Grabar-Kitarović went to become the first Croatian female President. The Croatian parliamentary election, 2015 resulted in the victory of the Patriotic Coalition which formed a new government with the Bridge of Independent Lists. However, a vote of no confidence brought down the Cabinet of Tihomir Orešković. After the Croatian parliamentary election, 2016, the Cabinet of Andrej Plenković was formed. ^ Antun Ivandija (April 1968). "Pokrštenje Hrvata prema najnovijim znanstvenim rezultatima" [Christianization of Croats according to the most recent scientific results] (PDF). Bogoslovska smotra (in Croatian). University of Zagreb, Catholic Faculty of Theology. 37 (3–4): 440–444. ISSN 0352-3101. Retrieved 18 October 2011. ^ a b "Povijest saborovanja" [History of parliamentarism] (in Croatian). Sabor. Archived from the original on 25 July 2012. Retrieved 18 October 2010. ^ Márta Font (July 2005). "Ugarsko Kraljevstvo i Hrvatska u srednjem vijeku" [Hungarian Kingdom and Croatia in the Middlea Ages]. Povijesni prilozi (in Croatian). Croatian Institute of History. 28 (28): 7–22. ISSN 0351-9767. Retrieved 17 October 2011. ^ a b "R. W. SETON -WATSON:The southern Slav question and the Habsburg Monarchy page 18". Archive.org. Retrieved 24 April 2012. ^ Robert A. Kann (1980). A History of the Habsburg Empire, 1526–1918. University of California Press. p. 611. ISBN 9780520042063. ^ Charles W. Ingrao (2000). The Habsburg Monarchy, 1618–1815. Cambridge University Press. p. 15. ISBN 978-0-521-78505-1. ^ ICTY (12 June 2007). "The Prosecutor vs. Milan Martic (paragraph 127–150)" (PDF). ICTY. Retrieved 11 August 2010. ^ Tim Judah (2001). The Serbs: History, Myth and the Destruction of Yugoslavia. Yale University Press. pp. 175–76, 244. ^ "Odluka Predsjednika RH o raspisu referenduma" (in Croatian). Narodne novine. Retrieved 1 August 2012. ^ "Yugoslavia Serbia Croatia War 1991". Onwar.com. Retrieved 24 April 2012. ^ "Croatian report from 1995". Unhchr.ch. Retrieved 24 April 2012. ^ "World Report 2011: Croatia | Human Rights Watch". Hrw.org. 24 January 2011. Retrieved 24 April 2012. ^ "Croatia | Human Rights Watch". Hrw.org. Retrieved 24 April 2012. ^ "EUROPA – Press Releases – EU closes accession negotiations with Croatia". Europa (web portal). 30 June 2011. Retrieved 24 April 2012. Roy Adkins; Lesley Adkins (2008). The War for All the Oceans. Penguin Books. ISBN 978-0-14-311392-8. Retrieved 18 October 2011. Damir Agičić; Dragutin Feletar; AnitaFilipčić; Tomislav Jelić; Zoran Stiperski (2000). Povijest i zemljopis Hrvatske: priručnik za hrvatske manjinske škole [History and Geography of Croatia: Minority School Manual] (in Croatian). ISBN 978-953-6235-40-7. Retrieved 18 October 2011. Ivo Banac (1984). The national question in Yugoslavia: origins, history, politics. Cornell University Press. ISBN 978-0-8014-9493-2. Retrieved 18 October 2011. Mark Biondich (2000). Stjepan Radić, the Croat Peasant Party, and the politics of mass mobilization, 1904–1928. University of Toronto Press. ISBN 978-0-8020-8294-7. Retrieved 18 October 2011. Peterjon Cresswell (10 July 2006). Time Out Croatia (First ed.). London, Berkeley & Toronto: Time Out Group Ltd & Ebury Publishing, Random House. ISBN 978-1-904978-70-1. Retrieved 10 March 2010. Sharon Fisher (2006). Political change in post-Communist Slovakia and Croatia: from nationalist to Europeanist. Palgrave Macmillan. ISBN 978-1-4039-7286-6. Retrieved 18 October 2011. Joerg Forbrig; Pavol Demeš (2007). Reclaiming democracy: civil society and electoral change in central and eastern Europe. The German Marshall Fund of the United States. ISBN 978-80-969639-0-4. Retrieved 18 October 2011. Richard C. Frucht (2005). Eastern Europe: An Introduction to the People, Lands, and Culture. ABC-CLIO. ISBN 978-1-57607-800-6. Retrieved 18 October 2011. Mirjana Kasapović, ed. (2001). HRVATSKA POLITIKA 1990.-2000 [Croatian Politics 1990–2000] (in Croatian). University of Zagreb, Faculty of Political Science. ISBN 978-953-6457-08-3. Retrieved 18 October 2011. Matjaž Klemenčič; Mitja Žagar (2004). The former Yugoslavia's diverse peoples: a reference sourcebook. ABC-CLIO. ISBN 978-1-57607-294-3. Retrieved 17 October 2011. Frederic Chapin Lane (1973). Venice, a Maritime Republic. JHU Press. ISBN 978-0-8018-1460-0. Retrieved 18 October 2011. 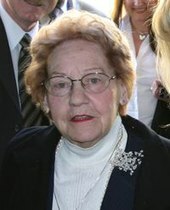 Branka Magaš (2007). Croatia through history: the making of a European state. Saqi Books. ISBN 978-0-86356-775-9. Retrieved 18 October 2011. Ivan Mužić (2007). Hrvatska povijest devetoga stoljeća [Croatian Ninth Century History] (PDF) (in Croatian). Naklada Bošković. ISBN 978-953-263-034-3. Retrieved 14 October 2011. Wikimedia Commons has media related to History of Croatia. The Kingdom of Croatia entered a personal union with the Kingdom of Hungary in 1102, after a period of rule of kings from the Trpimirović and Svetoslavić dynasties and a succession crisis following the death of king Demetrius Zvonimir. With the coronation of King Coloman of Hungary as "King of Croatia and Dalmatia" in 1102 in Biograd, the realm passed to the Árpád dynasty until 1301, when the (male) line of the dynasty died out. Then, kings from the Capetian House of Anjou, who were also cognatic descendants of the Árpád kings, ruled the kingdoms. Later centuries were characterized by conflicts with the Mongols, who sacked Zagreb in 1242, competition with Venice for control over Dalmatian coastal cities, and internal warfare among Croatian nobility. Various powerful nobles emerged in the time period, like Paul I Šubić of Bribir and Hrvoje Vukčić Hrvatinić, that secured de facto independence for their realms. The Ottoman incursion into Europe in the 16th century significantly reduced Croatian territories and left the country weak and divided. After the death of Louis II in 1526 during the Battle of Mohács and a brief period of dynastic dispute, both crowns passed to the Austrian House of Habsburg, and the realms became part of the Habsburg Monarchy. Bosanska Krajina, pronounced [bɔ̌sanskaː krâjina]; sometimes translated as Bosnian Frontier) or, sometimes, simply just Krajina, is a geographical region, a subregion of Bosnia, in western Bosnia and Herzegovina enclosed by a number of rivers, namely the Sava (north), Glina (northwest), Vrbanja and Vrbas. The region is also a historic, economic and cultural entity of Bosnia and Herzegovina, famous for its natural beauties and wildlife diversity. The Pannonian Basin, or Carpathian Basin, is a large basin in Central Europe. The geomorphological term Pannonian Plain is more widely used for roughly the same region though with a somewhat different sense, with only the lowlands, the plain that remained when the Pliocene Epoch Pannonian Sea dried out. Baranya or Baranja is a geographical and historical region between the Danube and the Drava rivers. Its territory is divided between Hungary and Croatia. In Hungary, the region is included into Baranya county, while in Croatia, it is included into Osijek-Baranja county. Ilok is the easternmost town and municipality in northeastern Croatia. Located in the Syrmia region, it lies on a hill overlooking the Danube river, which forms the border with the Bačka region of Serbia. The population of the town of Ilok is 5,072, while the total municipality population is 6,767. The town is home to a Franciscan monastery and Ilok Castle, which is a popular day trip for domestic tourists. The Serbs of Croatia or Croatian Serbs constitute the largest national minority in Croatia. The community is predominantly Eastern Orthodox Christian by religion, as opposed to the Croats who are Roman Catholic. Ban of Croatia was the title of local rulers or office holders and after 1102, viceroys of Croatia. From earliest periods of Croatian state, some provinces were ruled by bans as a ruler's representative (viceroy) and supreme military commander. In the 18th century, Croatian bans eventually became chief government officials in Croatia. They were at the head of Ban's Government, effectively the first prime ministers of Croatia. The institution of ban in Croatia persisted until the 20th century. The Kingdom of Croatia was part of the Habsburg Monarchy that existed between 1527 and 1868, as well as a part of the Lands of the Hungarian Crown, but was subject to direct Imperial Austrian rule for significant periods of time, including its final years. Its capital was Zagreb. The Triune Kingdom or Triune Kingdom of Croatia, Slavonia and Dalmatia was the concept—advocated by the leaders of the 19th century Croatian national revival—of a united kingdom between Croatia, Slavonia and Dalmatia, which were already within the Austrian Empire under one king, who was also the Emperor of Austria, but were politically and administratively separate entities. This concept had roots in the high medieval period. Prečani was a Serbian blanket term used at the end of the 19th- and early 20th century for ethnic Serb communities located preko ("across") the Danube, Sava and Drina rivers, beyond the northern and western borders of 19th-century Serbia, that is, in Austria-Hungary-held Vojvodina, Bosnia and Herzegovina and Croatia. It was thus used to distinguish Serbs of Serbia ("Serbians") from those in the historical Habsburg Monarchy; it was not applied to the Serbs of Montenegro or those in the Sanjak of Novi Pazar and elsewhere in the Ottoman Empire. In the history of the Austria-Hungary trialism was the political movement that aimed to reorganize the bipartite Empire into a tripartite one, creating a Croatian state equal in status to Austria and Hungary. Franz Ferdinand promoted trialism before his assassination in 1914 to prevent the Empire from being ripped apart by Slavic dissent. The Empire would be restructured three ways instead of two, with the Slavic element given representation at the highest levels equivalent to what Austria and Hungary had at the time. Serbians saw this as a threat to their dream of a new state of Yugoslavia. Hungarian leaders had a predominant voice in imperial circles and strongly rejected Trialism because it would liberate many of their minorities from Hungarian rule they considered oppressive.